I recently upgraded my system to Ubuntu Jaunty, and noticed that a ton of window animations in compiz had disappeared. This, of course, frustrated me, as the burn animation is my personal favorite and the one I use on all normal windows. For some reason (and I can't figure out why), the animation add-ons appear to be disabled by default in Jaunty. Or maybe it happened when it upgraded compiz, I'm not really sure and I don't know enough about Ubuntu to say. But either way, enabling the animation add-ons fixed the problem. So anyone out there, if you're all the sudden missing a ton of animations, make sure that animation add-ons is enabled before you go to irc.freenode.net/#ubuntu and make a royal idiot of yourself. When you click on the tray icon, that window pops up, much like when you click on the clock in Windows Vista. You can then add timers using the text fields on the right. The timers that you've added show up to the left. You can click on the button that shows the time remaining to pause the timer. When a counting-down timer reaches 0, a window opens up that says "Timer 1: Time's up". The code for the program is available at http://jwutils.googlecode.com/svn/trunk/projects/text/binutils/src/com/googlecode/jwutils/timer/. 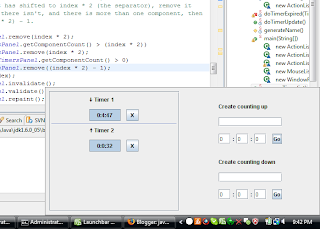 Download all four source code files, compile them, and run TrayTimer. Or you can svn export that url and compile it. I'll post a download soon that contains the whole thing already compiled. I just got another web application up and running, Javawizard's Surveyer. It's a web application for creating and taking surveys. It's not fancy or anything (I wrote it in less than 2 days), but it's easy to use, and free. In a few days, I'm going to add the ability to actually embed a survey within an email. When you open an email with a survey, there isn't a link or anything; the email actually appears inside of the survey. I've tested it out with gmail and yahoo mail, and it works with both. For those out there that would like to access pastebin.com from within a java class to create, read, and delete posts, I decided to write a class that does just that. Currently, it only creates pastebin posts, but I'm working to add functionality to read and delete posts as well. You can download the current version at http://code.google.com/p/jwutils/source/browse/trunk/projects/jzbot/src/org/opengroove/jzbot/utils/Pastebin.java. This will automatically update as I add more code to the class.